That's a wrap on Orange Is the New Black. Cast and crew from the hit Netflix show officially wrapped production on Season 7 earlier this week and they have all been sharing videos and pictures on social media to celebrate. Netflix has yet to announce when the seventh and final season will be streaming, but one can easily see the show coming back early this summer, which would follow tradition from the past six seasons. 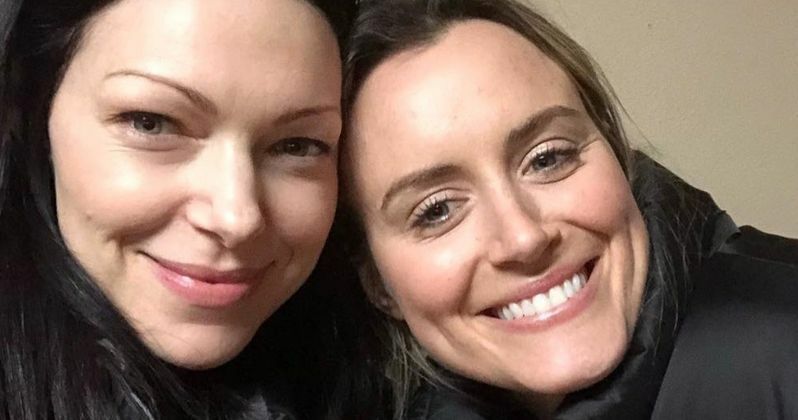 Orange is the New Black star Taylor Schilling posted a video that consists of 7 years-worth of photos of the hit show that are up on a wall. It's a pretty cool little video that has official pictures from the show mixed in with a bunch of behind-the-scenes shots that have never been shared before. Schilling had this to say about the show officially coming to an end. "OITNB series wrap! WHOA. My heart is full and achy and so overflowing with gratitude I'm a little dizzy." Orange is the New Black Season 6 ended with Taylor Schilling's Piper character getting out of prison early, while Taystee was found guilty for the murder of Piscatella and sentenced to life behind bars. The next season may go into Piper getting ready to write her memoir. It was announced back in October that the hit Netflix show was calling it quits after Season 7. Executive producer and creator Jenji Kohan released a statement at the time, which you can read below. "After seven seasons, it's time to be released from prison. I will miss all the badass ladies of Litchfield and the incredible crew we've worked with. My heart is orange but... fade to black." Jessica Pimentel plays Maria on Orange is the New Black and in addition to her posts about the show ending, she posted a picture of the crew that is responsible for making the show. Pimentel also revealed a little tradition that the show has at the end of wrapping a season, which involves all going out to a bar together to celebrate. It was a nice gesture of the actress to shine a light on the men and women who work behind the camera and don't normally get the shout outs. Jenji Kohan posted a photo of the entire cast and crew with a caption that reads, "This is a family." Though production on Orange is the New Black officially wrapped on Tuesday, other actors and actresses from the show have been posting their goodbyes for the past several days, which have been collected and placed below. It looks like the cast and crew all became a pretty tight-knit family while making the hit show over the course of seven seasons. You can check out all of the goodbyes to Netflix's Orange is the New Black below.